Arrival of mains water, sewage, electricity telephone and first car. 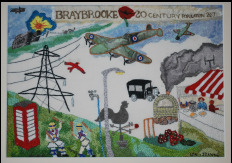 Braybrooke is part of WWI and WW2. 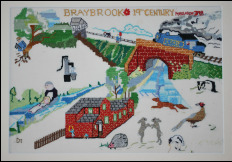 20th Century Braybrooke by Lyn Birkett and Joanne Lister. Jubilee tree cut down on Green. Labourers go to Great Exhibition by train. 19th Century Braybrooke by Dot Tyers (Margaret Mansfield). Common and open fields enclosed. Robbery at Castle Farm - £1600!! Vamp Horn used in Church. Landowners expected to provide militia. Scenes from daily life including spinning, farming. 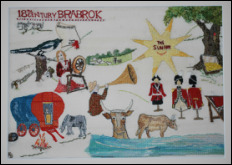 18th Century Braybrooke by Karen Stanley. Rev John Mapletoft leaves £50 for children’s education. 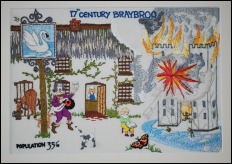 17th Century Braybrooke by Jo Butterworth. ​Griffin Chapel added to Church. Elizabeth I visits Sir Thomas Griffin. 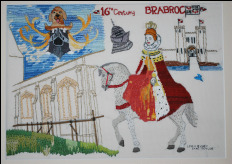 16th Century Braybrooke by Jane Taylor and Linda Busby. Czech scholars at Castle translate Lollard texts. John Griffin inherits the Castle Estate. 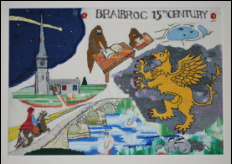 15th Century Braybrooke by Alex Corderey and Barbara Lynch. East Hall Manor becomes Braybrooke Castle. Black Death comes to the country and the village. 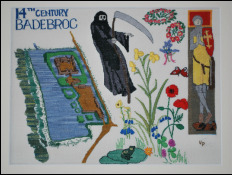 Local plants and herbs used to combat the Black Death. Effigy of Sir Thomas Latymer in Church. 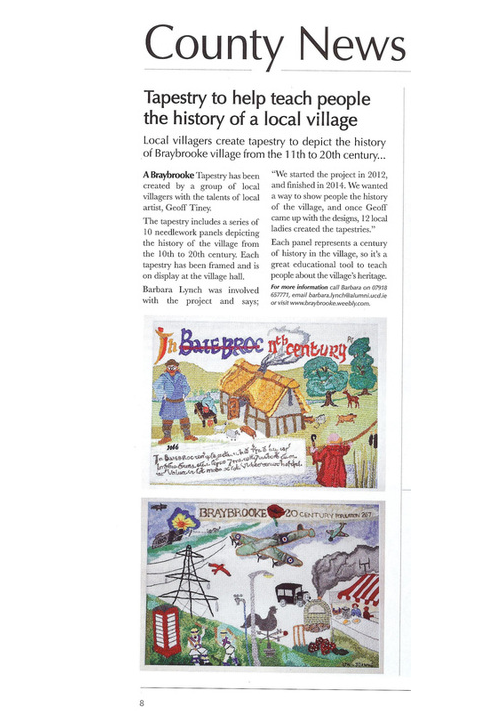 14th Century Barybrooke by Val Panter. Development of East Hall Manor. Sir Thomas Latymer takes possession of the Manor. Pipewell Abbey improves the Grange. 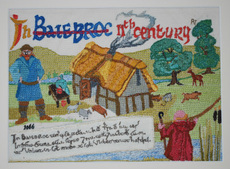 13th Century Braybrooke by Ruth Tiney. The intermarrying of Saxon and Norman symbolised by the wedding bouquet of local flowers. Font in Church depicting a fish eating mermaid. 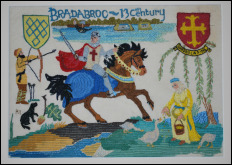 12th Century Braybrooke by Sylvia Hesford. Chetelbert with his Saxon family and neighbours living along the river unaware of the great changes about to occur at the end of the century. ​Braybrooke’s short time as part of Rockingham Forest. One of the entries in the Domesday Book for Braybrooke. Church comes under the patronage of Daventry Priory. 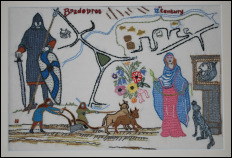 11th Century Braybrooke by Ruth Tiney (Cindy Chudley).